What is it like to see something so far away? Such an experience is surreal and exciting for many. The Gunnison Valley Observatory offers this ability to its visitors. The observatory is the product of generous donations and hard-working volunteers, all pooling together to give the citizens of Gunnison County a chance to gaze upon the cosmos. Operating since 2008, it is now celebrating its ten-year anniversary—currently offering public viewings every Friday and Saturday until the second weekend of September. Visitors of all kinds are welcomed and encouraged to participate in their star-gazing. The observatory is operated primarily by volunteers who are enlisted to help during the summer. Summer is the primary view season. There are 20 to 25 volunteers at present. One does not need to be an expert in astronomy to volunteer. Volunteers are tasked with greeting the guests, acting as speakers and operating the equipment. Volunteers can expect to learn presentation and greeting skills and how to operate the observatory’s equipment. “I think the biggest things that our volunteers can expect is to gain a deeper appreciation of the night sky, especially here in the Gunnison Valley where we can have some amazing views, and then to be able to share that appreciation with others,” says observatory board president Chris Flores-Madison. The observatory begins welcoming visitors at 8 p.m. and closes at 11 p.m. When everyone is present and accounted for, the volunteers begin with a 30-minute presentation, the topic of which varies with the day. After the presentation has finished, visitors are divided into two groups—one to look through the observatory’s primary telescope, and another to look through smaller telescopes outside before switching places. The earliest visitors get to use the primary telescope first. The room housing the primary telescope is filled with pictures depicting various galaxies and star clusters for visitors to marvel, in the event that the telescope cannot be used. The telescopes are so strong, they can show a viewer the moons of Jupiter or the Rings of Saturn. In addition to the telescopes, the observatory offers a tablet that visitors can use to track where the constellations go in the night-sky. Visitors are welcome to visit free of charge (although, a donation to improve the observatory would be appreciated). The usual summer visitor count ranges from 1,300 to 1,600 each year, with the types of visitors coming from within Gunnison County, and from all over the United States and Europe. The presentations they provide are both engaging and fun as the volunteers strive to help them understand the subject while also providing them with a good laugh. Flores-Madison says visitors see a lot to get excited about but it is seeing the neighboring planets that generates the most excitement. “Without a doubt, people love to see the planets. We show globular clusters, galaxies, nebulae, etc. but nothing quite captures the imagination as seeing a planet. You go from seeing a picture in a book, to seeing the real thing, it’s an amazing experience. When someone looks through a telescope at Jupiter or Saturn and you hear them gasp—you can’t beat that feeling,” he exclaims. 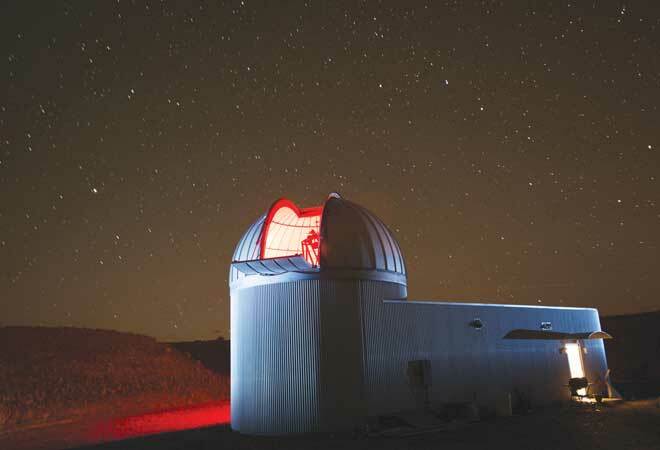 The Gunnison Valley Observatory plans to continue in this direction for many years to come, welcoming new visitors and offering them a chance to understand and better appreciate the cosmos, so long as the weather does not get in the way, of course.